ORANGEVILLE, Ill. (AP) — A 6-foot-4-inch cow owned by an Orangeville woman was recently dubbed the world’s tallest. Patty Hanson and Blosom the cow smiled for their official Guinness World Records photo shoot Monday. Hanson received an email in mid-August saying Blosom had been named the world’s tallest cow. She sought the record after veterinarians and the cow’s foot trimmer constantly noted the 2,000-pound animal’s large size, Hanson said. At the end of May, family and friends began documenting Blosom’s mass through photos and videos. Her official measurements were taken by a vet from Orangeville Animal Health Service. “When I put Blosom’s halter on, she knows it’s time to go to work greeting people, and one of the best things I love about this big cow is she makes people smile. But now when I get to tell them they are looking at the world’s tallest cow, I can’t wait to see their reaction,” Hanson said. Hanson got Blosom when she was a calf and eventually decided to keep her as a pet. She turned 13 in July. “My dad used to chuckle at Blosom, but soon softened up to her, which is why she stayed home on the farm as an addition to the many pets — she adds character,” Hanson said. Hanson said she wants to turn Blosom’s story into a children’s book someday. 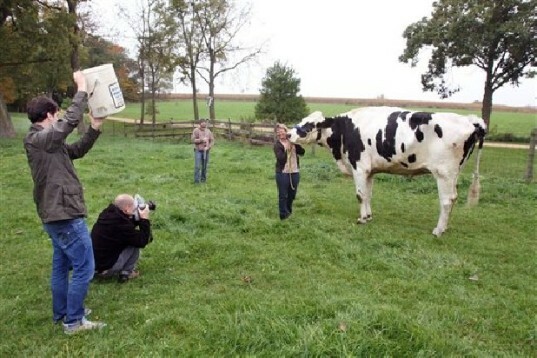 via Guiness Book of World Records dubs Illinois pet ‘world’s tallest cow’ | Times Free Press.